Brookhaven Retreat®, LLC, a unique residential treatment facility exclusively for women with mental health and/or substance abuse issues, celebrated National Iced Tea Month by Serving Peach-Thyme Iced Tea During Afternoon Tea Time on June 12th. Each June, National Iced Tea Month is celebrated to recognize the popularity of iced tea within the United States. Iced tea is a form of tea that can be sweet, unsweet, or flavored and served over ice. Generally, black tea is used to create iced tea, but any form of tea can be used for a unique flavor combination. Place honey, chopped thyme, room-temperature water and 4 cups of the peaches in a pan. Cover and bring to a simmer over medium-high heat. Stir and reduce heat to low. Simmer, covered, stirring occasionally, for 30 minutes. Let cool completely, about 30 minutes. Pour mixture through a wire-mesh strainer, pressing solids to extract the juices. 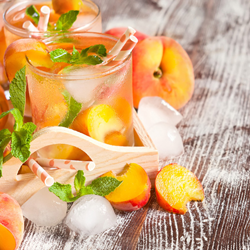 Place tea bags and remaining 2 cups peaches in a 3-quart heatproof pitcher. Add boiling water; let steep for 15 minutes. Discard tea bags. Stir in lemon juice or peach syrup, if desired. Serve over ice. Garnish with thyme sprigs and lemon slices. Clients will also be enjoying an iced tea tasting featuring three unique iced tea creations created by Brookhaven Retreat’s Dietician, Charity Coyle, on Wednesday, June 15th in recognition of National Iced Tea Month.